Song for the (Hump) Day: Madonna "Justify My Love"
Well look at that, folks: it's Hump Day once again, and the associated mood is once again upon me. Today looks to be an especially steep hump for me today at the workplace, too, so it appears necessary not only to choose a great Song for the Hump Day, but to pull out the big guns as well today. Fortunately, a certain special pop legend celebrated her 52nd birthday earlier this week, and the icon in question happens to be one of the great sexual pioneers/"pop perverts" of pop music history. Yes, our lady Madonna is over the half-century mark and still sailing on, boinking 20-somethings with similarly religious names, attempting to adopt much of the non Jolie-Pitt sub-Saharan youth, and bathing daily in hundred dollar bills and caviar. Those of us who fall firmly within the bounds of the Millenial generation no longer have the same appreciation of Madonna that our very near elders do; children of the late '90s like myself typically see her Madgesty through the post-William Orbit/Ray of Light lens, and are more likely to recall her Hard Candy album cover crotch shot than blonde ambition or conical brassieres. Luckily, somewhere along the way one of my dear friends had enough sense to browbeat me into purchasing The Immaculate Collection and actually listening the whole way through (despite my well documented dislike of most '80s pop), which is how I happened upon a pair of songs that maybe didn't change my life but definitely supplied legitimacy (and more than a few helpful pointers). Eventually I sought out the video for one of them, "Erotica," and found it to be quite what I was expecting, if I was expecting anything in particular. As edgy as it was in 1990 upon its release, the video for "Erotica" isn't quite yet totally tame by 2010 standards, but neither is it anything I hadn't seen before or felt I shouldn't be seeing. Graphic treatment of sexual themes was, after all, my forte. It was when I encountered the video for the second number of the dirty duo that, for the first and probably only time in my life, I fully appreciated the true power and impact of Madonna's sexuality, in a visceral way I imagine was standard at the start of the 1990s: something from the pop music past that was all but impossible to relive. It wasn't because "Justify My Love" was graphic, though, just as the song itself isn't: in fact, it was quite the opposite quality that affected me so strongly, the subtlety and requirement of imagination finally proving what my dad had told me at the outset of my pubescent years: "Seeing everything is rarely half as exciting as when something is left to the imagination." To this day, the song is one of the few songs that has the capability of turning me on at least a few degrees when it plays, regardless of situation or mood or anything else. 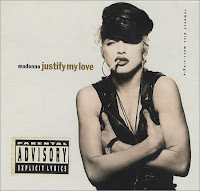 So for this particularly hefty Hump Day, get open and ready, and enjoy Madonna's sexiest track ever, "Justify My Love."